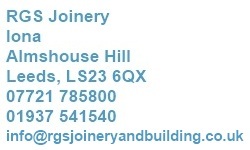 We found RGS Joinery through the website for the Federation of Master Builders (FMB) when we submitted a request for quotes for the replacement of two external doors. Gordon replied quickly and visited soon after. Unlike several other joiners, Gordon took the time to inspect the doors properly and noticed that one door in particular would be slightly problematic owing to its age and installation, but came up with some solutions quickly. Gordon completed the work in two days, managed to work around a few further unexpected issues (like a sloping lintel none of us had ever noticed! ), readjusted the height of the door handles to be in line with others in the house (more work for him, just to improve the aesthetics), and was exceptionally friendly and tidy. He even noticed a fault with one of the new handles and was honest enough to point it out, get a replacement, and return with the new one after being paid! Gordon was a fantastic find and did a superb job. We would both recommend him to others, and use him again ourselves.